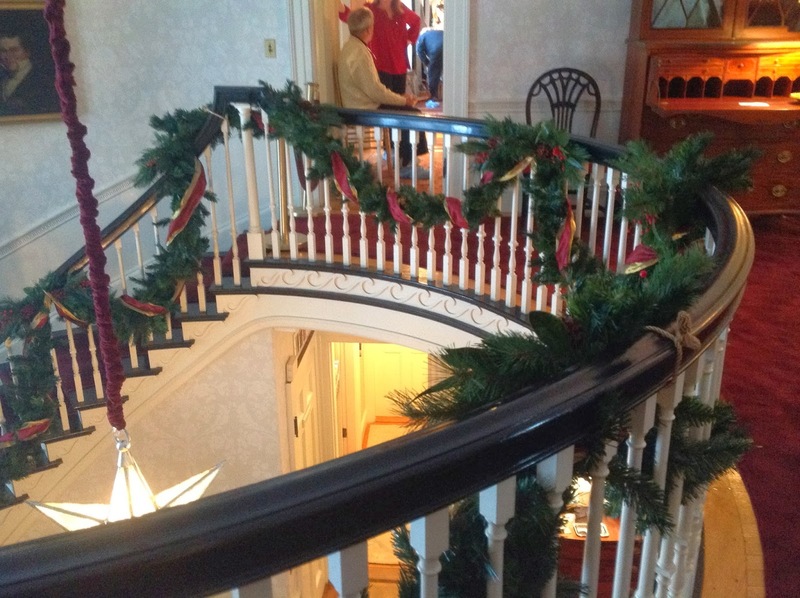 Contrary to what is the normal holiday show house, the Danvers Historical Society show this year was a real designer showhouse where the professional designers not only added some holiday flair to the space, but also truly designed their rooms from floors to ceilings. The location for this year’s show house was the Endicott mansion at Glen Magna Farms, which is a popular destination for weddings. I attended a wedding their many years ago. The grounds are beautiful in season, but also on a snowy winter’s day like the one we had the day I was there. 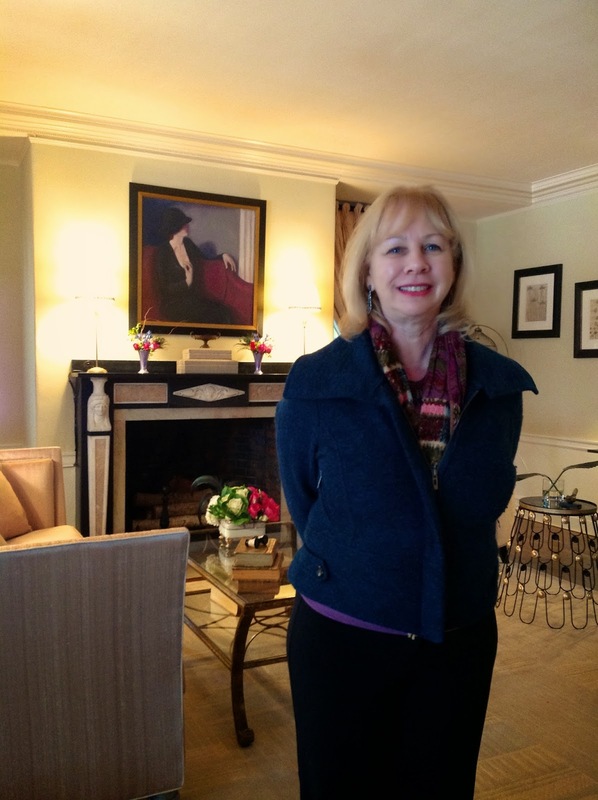 The Danvers Historial society is renovating the mansion, ground and the famous Derby Summer House. (below photo courtesy of Danvers Historical Society). One of my long time design friends Donna Terry (center above) undertook the largest space in the house, the drawing room. At 20 x 40, this was a massive undertaking which gave Donna a chance to showcase her deep knowledge of Art Deco style as well as her background in set design. Flanking Donna are Wayne Eisenhauer, chair of the Historical Society, and Sandra Biondo, chair of the Show House. Donna’s room had so many gorgeous details. It was also a lot warmer in color tone than these photos show. Donna designed and had fabricated the custom window treatments and the sofa above. The header on the window treatments is an original Donna Terry detail. The three stripe motif on the treatments is an homage to the art deco era usage of three stripes to denote speed and modernity. 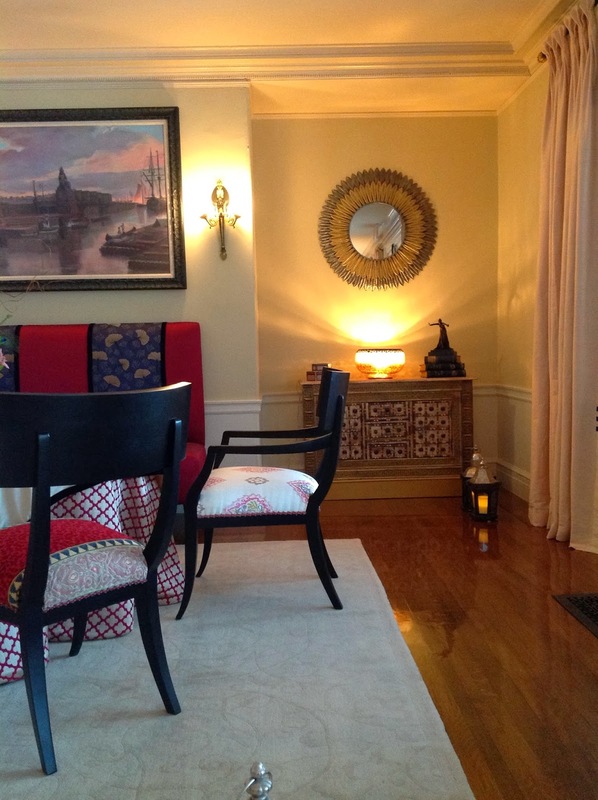 Across from the sitting area is a dining space that is filled with gorgeous exotic fabrics and objet d’art. 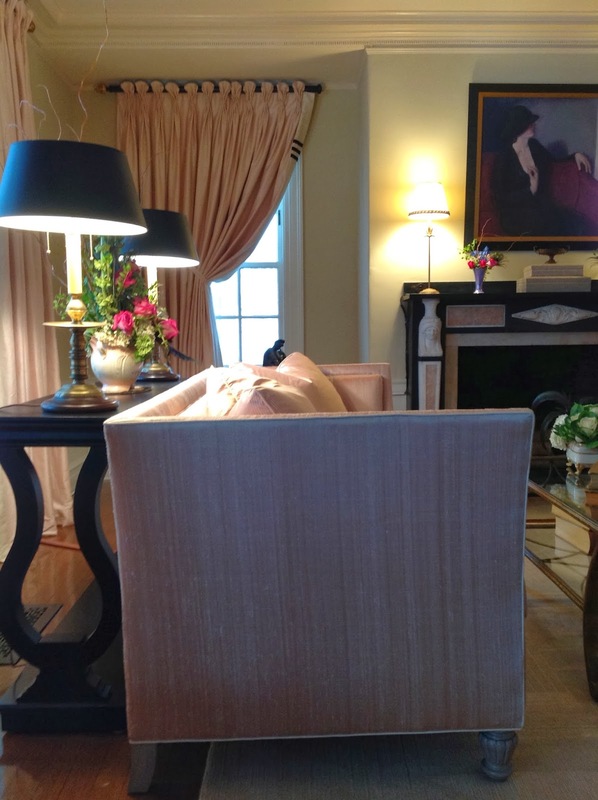 The light fixture on the sideboard above was designed for the space by Donna. The Endicott Library was decorated by William Ralph, Fine Antiques & Design. 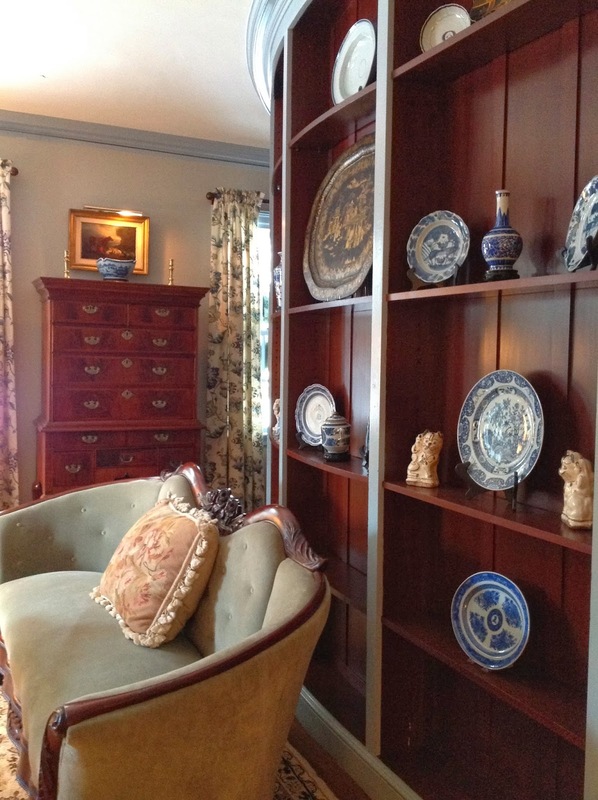 The unique highlight of this space is the curved bookcase, which serves as the perfect place to highlight a gorgeous collection of blue and white china and other decorative objects. The Peabody Parlor designed as a private family dining room. And William Ralph in his space. The pendant light fixture over the table was designed by Mr. Ralph. The architectural detail of the house is gorgeous. 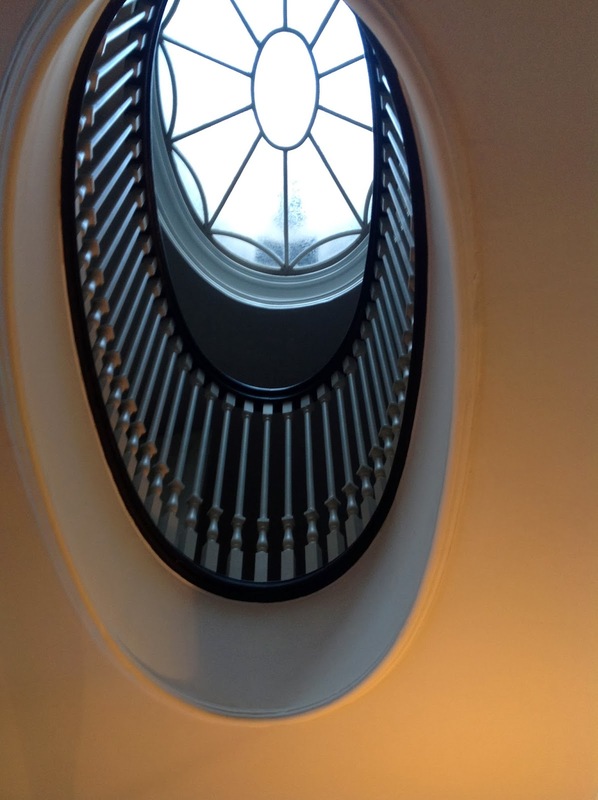 The carved, curved stair case (2nd floor landing) with a mirroring skylight above. 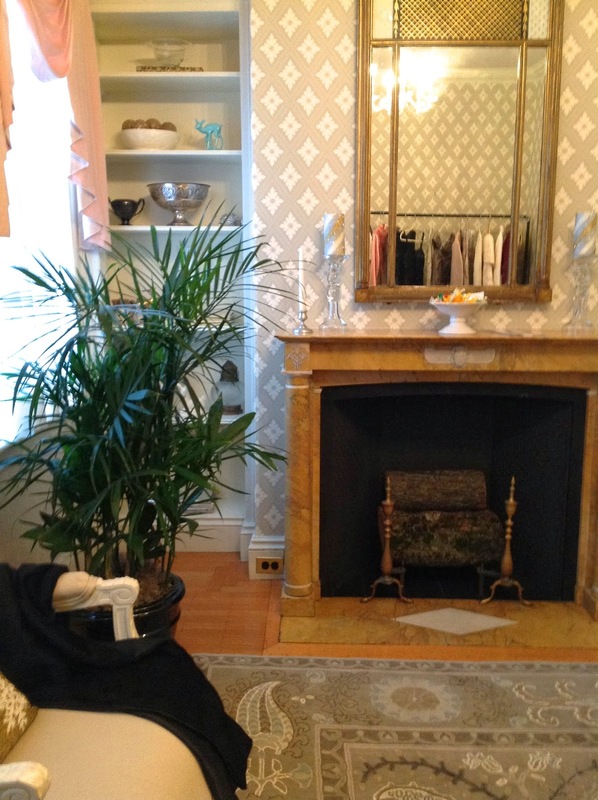 Another design friend, Yvonne Blacker, designed the powder room in a decidedly feminine fashion with a bridal themed color palette. The tiny bathroom off this space featured a lovely wall treatment painted by Mary Taggart of Wakefield TaggArt Studio. 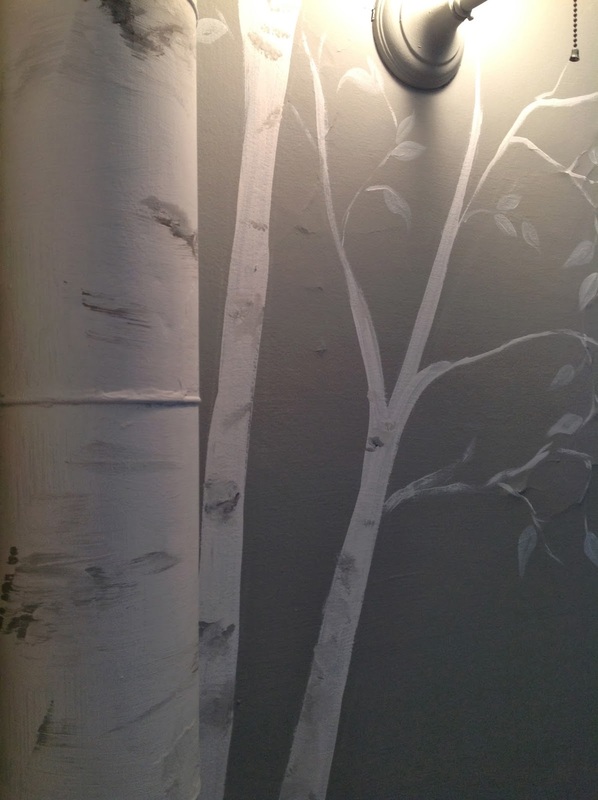 The usually clunky stack pipe was painted like a birch tree, to blend with the wall treatment. How cute an idea is this! 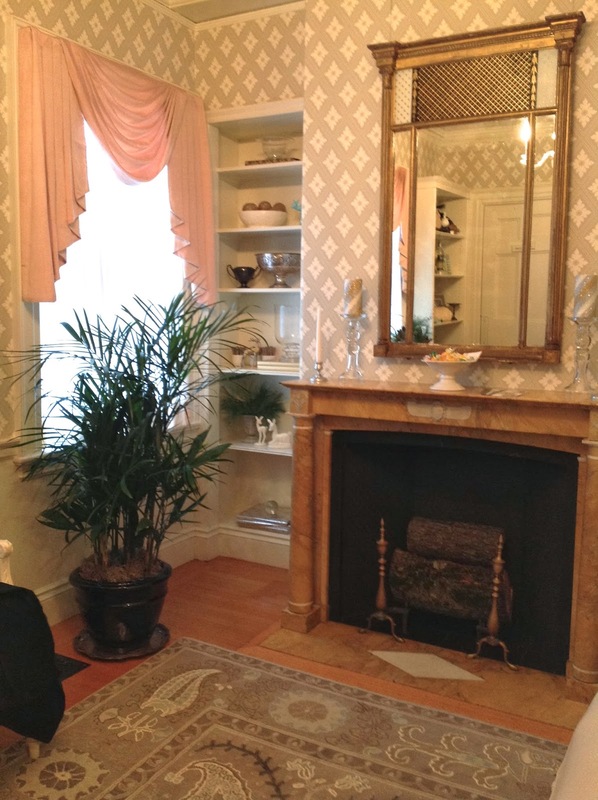 Thanks to Yvonne and the folks at the Danvers Historical Society for inviting me to browse the showhouse. Stay tuned in late Fall/early December of 2014 for their next showhouse!